The Status screen displays overall details on the current status of your car. This indicates whether the car is Parked or Driving. This indicates whether the car is currently charging or not. Note: If super-charging is detected that will be indicated. An image representing the specific Tesla model type is displayed. For some Tesla car models, the image may also display door, trunk, frunk and charging port and cable states. This value indicates the estimated average energy usage since the last charge. This value is calculated based on Tesla reported factors such as Rated Range (or Typical Range in Europe), Projected Range and nominal energy usage. The display units of energy usage are either Wh/mi or mi/KWh. 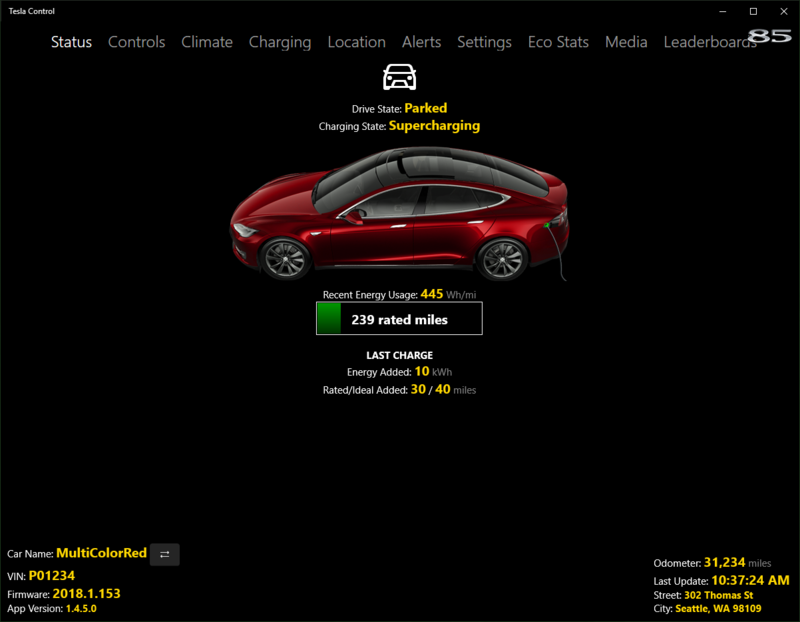 The green bar and text indicates the battery level reported by Tesla servers for the vehicle as well as either the Rated range (Typical in Europe) or Ideal range (Rated in Europe). The display units for range are either mi or km. This section displays the following values since the last charging session as reported by Tesla servers.